Kangovou was launched in 2012. Kangovou is the result of the drive, dedication and vision of two mom entrepreneurs. Pretty Govindji, spent her career in human resources prior to becoming a mom of three boys. While raising her sons, Pretty decided she wanted to move her family to a more healthy way of eating. She began to educate herself on pesticides and chemicals and the role they played in the food supply chain. During the education process Pretty listened to news reports regarding plastics which were considered unsafe because they contained chemicals such as PVC, BPA and/or melamine. It was then that Pretty realized that what she served her children’s food on was just as important as the food itself. 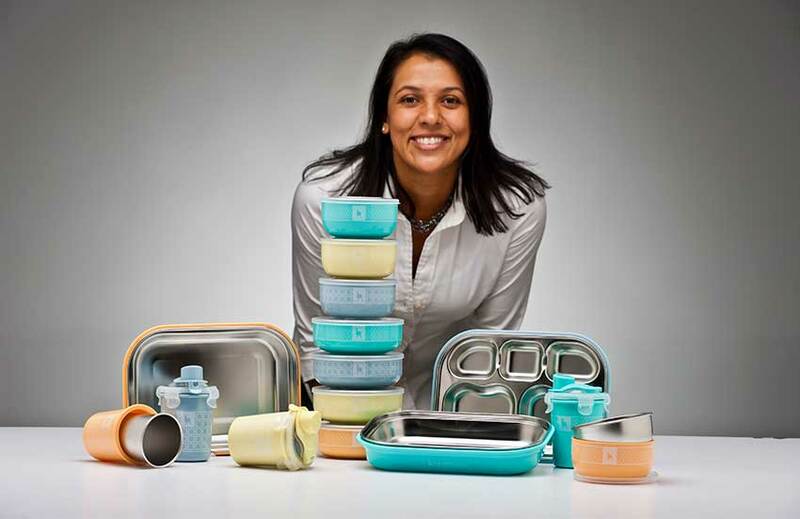 Kangovou Founder Pretty Govindji couldn’t find quality dishware that was safe for her whole family – so she made some herself! It was at this time that Pretty decided to rid her cabinets of the cute plastic plates, cups and bowls she had collected over the years and decided to replace plastic with a known-to-be-safe and naturally antibacterial product, stainless steel. Pretty spent the next several years asking friends and family on international travel to bring back stainless steel cups, plates and bowls. Pretty’s kitchen became a “test kitchen” and her three sons became product testers. Pretty and her family used these items to help determine which plates, cups and bowls worked better than their seemingly similar counterparts. In 2011, Pretty enlisted her friend and fellow mom Theresa “Tess” Brennan. Tess is a mom of twin girls and has worked in the biopharmaceutical industry for the last eighteen years. Tess was looking for a creative outlet and was immediately on-board when Pretty asked her to join her in building an eco-friendly, mom-owned business. Tess also had a kitchen filled with plastic kid plates and was becoming increasingly interested in the benefits of stainless steel. As they began to create the Kangovou product line Pretty and Tess quickly recognized that there was a void in the product offerings currently sold on-line and in stores. The Kangovou mission became clear: to create a versatile kid’s dishware set which was made of high quality food-grade stainless steel, free of BPA, PVC, phthalates, lead and melamine, offered as a complete set and was ethically manufactured and reasonably priced. These requirements combined with their experience as moms is the driving force which created Kangovou and the nine piece kid’s dishware set.